Moscow-trained Marat Bisengaliev, co-founder and music director of the Symphony Orchestra of India talks to RIR about the efforts being made to popularize western classical music in India and in training the country’s own professional musicians. Born in Kazakhstan, USSR, in 1962 and educated at the Tchaikovsky Conservatoire in Moscow with two of the legendary names in violin tuition, Boris Belinki and Valery Klimov, Marat Bisengaliev settled down in England after the break-up of Soviet Union. Leading an orchestra is not new to him. 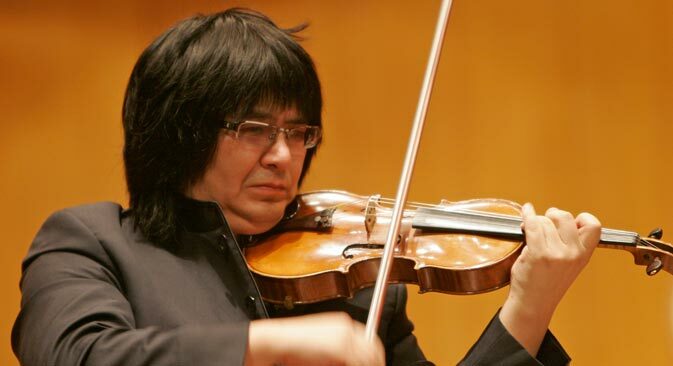 In 1989 Bisengaliev founded the Kazakh Chamber Orchestra with whom he toured as a soloist throughout Europe. After 1991 the orchestra was re-founded as the West Kazakhstan Philharmonic Orchestra and later became a core of the Symphony Orchestra of India (SOI). Can you tell us the story of SOI’s formation, when and how did you and the National Centre for Performing Arts (NCPA) find each other? It was somewhere in 2004 when my West Kazakhstan Philharmonic Orchestra was performing in one of the cathedrals in central London. Accidentally Mr. Khushroo N Suntook, NCPA Chairman, and Brinda Khatau, NCPA Council Member, heard us playing. They liked the performance and came to the dressing room. That’s how we met. Mr. Suntook invited me to perform at NCPA with the same orchestra. After just three months we were playing a concert in Mumbai. Our friendship evolved, we were meeting not only in India, but in London. During one of such meetings, over tea, we decided to establish a symphonic orchestra in India. It was a very ambitious project. Dr. Jamshed Bhabha (the brother of founding father of India’s nuclear program, Dr Homi Bhabha) supported us that time and even years after his death he still supports us, spiritually, financially. His support played a vital role in the future of SOI. Well, it was very important to start with musicians, who are already perfectly coordinated, that’s why my Kazakh orchestra became a core of SOI. By that time I was already established in UK, so I invited British musicians too. Russian and Soviet schools of violin and cello are world-recognized, as well as English and French school of wind instruments. It was kind of marriage of Eastern-European strings school and Western-European wind instruments tradition. Two years back we started string classes at NCPA. They are taught according to the traditional Russian method by teachers from Russia and former Soviet Republics who also work in SOI and stay in Mumbai permanently. Our next step is to establish wind instruments classes based on English and French traditional school. What is the Russian method and how does it differ from music education here in India? Firstly, there is no methodical system of (western) musical education in India. There are private tuitions in Mumbai, Chennai, Bangalore, Kolkata, which have been there since early 20 century. But they are too far from what is required to train professional musicians. Russian musical education has a network of specialized music schools spread all over Russia and the former Soviet Union territory in its core. Children get admitted at the age of six-seven through a tough competition. They study 11 years at school, then 5 years in conservatory, which we probably will establish in India someday, and after conservatory you have several years of postgraduate studies. Only then you can really create a professional musician. In any Russian music school, besides regular instrumental classes, you have many subjects such as music theory, analysis, harmony, solfeggio, rhythm and music literature. So at the NCPA school too, children have all these subjects and one-to-one instrumental classes daily. We started recently, but we already have some results. I will be coming back to Mumbai in June to perform with an orchestra and several of the most talented children. I would like to show what can be achieved in such a short span of time with Russian system of music education. How do you admit children? Are they all Indian children or you having expats’ children too? As of now all our students are Indian children. You have to understand that in India this whole atmosphere of Western musical culture does not exist. There is no such custom among children and parents as well. Therefore we first had to create some quantity. For that we adopted Suzuki teaching method originated in Japan. It teaches children music by learning through ear training, like a game, it can be taught to 20-30 children at a time. We started with this, we got the quantity and then we chose several talented children to proceed further with very structured and intense Russian traditional method. It’s just a beginning, but in some fifteen years you will see mostly Indian musicians playing in the SOI. What, in your opinion, should be done to expand the audience of classical music lovers in India? There is a big army of SOI friends, from the Parsi community, who come to each and every concert from season to season, but we definitely see that the Indian middle class is developing very fast. We need to adjoin it with Western classical music giving more people a chance to discover this music. There are different views on that, some are purist, and some are liberal. I believe we need to go beyond the traditional scope of classical music, play Andrew Lloyd Webber, Karl Jenkins, play something from Bollywood. We need more outreach, we need to play open air concerts for thousands of people, and let it be popular classics, for example famous John Williams’ music composed for Star Wars and Superman. On the contrary, Mr. Santook sees classical music as an exclusive art for exclusive audience. Well, thought thrives on conflict. In 2010 SOI created history with its first international debut at the Fifth Festival of World's Symphony Orchestras in Moscow. How did the Moscow audience accept the musicians? To be frank nobody in Moscow seriously expected an Indian orchestra to play. We performed Beethoven's 9th symphony in the House of Columns, with Alexander Anisimov conducting, and people were, to put it mildly, surprised. We were greeted with standing ovation. Which Russian musicians would you like to see in India? Conductor Fuat Mansurov was one of the first Soviet and Russian conductors to perform with SOI. Alexander Anisimov has come to India several times already and will be coming again soon. We have invited violinist Evgeny Bushkov, conductor and pianist Vag Papian. I’d like to invite such great conductors as Yuri Simonov, Vasily Petrenko , Alexander Lazarev , Vladimir Fedoseev. And Mikhail Pletnev, of course, not only as conductor, but as pianist. He is the best interpreters of Tchaikovsky. Many note that it is Tchaikovsky which SOI performs the best. Why so? Well, most of musicians are from Russia, post-Soviet countries and largely Eastern Europe. On one hand it is an impact of Russian school of strings and on another… it is a soul. These musicians not only perform techniques, they do feel the music like no one else can.